GTI, leading Microsoft Systems Integrator in Hong Kong and China, and Solgari, the Dynamics 365 All-Channel Communications Solution, announce strategic partnership. All communications within Dynamics 365 – Voice, Video, Chat, SMS – providing a brilliant a seamless user & customer experience and allowing secure credit card payments. 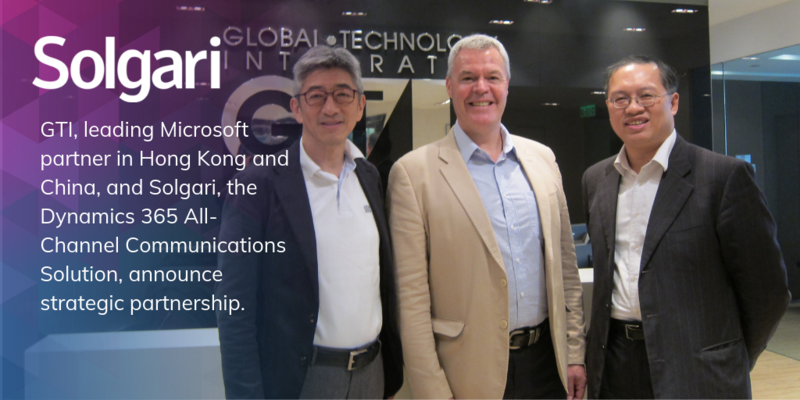 Hong Kong – 29th March 2019 – Solgari, the provider of All-Channel Cloud Communications Services, and Global Technology Integrator (‘GTI’), the leading Microsoft Dynamics 365 partner in Hong Kong and China, today announced their partnership to bring Solgari’s Dynamics 365 All-Channel Solution into specific local industries such as financial services and NGOs. Solgari is the enterprise solution for organisations with demanding, multi-channel needs, who are looking to increase efficiency and effectiveness, meet all related compliance requirements, and to delight customers. Our solution is used in over 40 countries to-date, serving customers across financial services, FinTech, retail, eCommerce and many more, all on a per user per month SaaS model. As a global Microsoft ISV, Solgari works with the leading Microsoft partners who are building transformative cloud solutions on Dynamics 365 for their customers. GTI provides leading edge solutions of modernized infrastructure, IT security, cloud computing, mobility, CRM, digital marketing and a broad portfolio of IT services that serve the needs of enterprises and public organizations in Hong Kong and in China. GTI has developed cloud solutions for both NGO and financial services customers based on Dynamics 365 and is seeking to add further value to these solutions around the adoption of best of breed solutions that complement Microsoft’s cloud applications. Solgari’s Dynamics 365 All-Channel Solution is driven through Microsoft’s Channel Integration Framework, meaning seamless integration in the browser, rapid on boarding and setup for our customers through Single Sign On and no software to download. Solgari and GTI are working together to bring this solution specifically to financial services, retail and NGO operations who want to offer their customers and partners all the communication options and compliantly handle payments. Wow customers and partners by offering a seamless experience across all the digital communication channels such as voice, video, SMS & chat. Provide your Dynamics 365 staff users a single view of all customer interactions across whatever channels are required. Automatic compliance around various regulations such as PCI DSS to allow secure credit transactions for payments and donations. Analyse and assess company performance. All available per user per month. Consolidate IT in the cloud, driving cost savings versus using multiple disjointed vendors. Innovation is the key to success of many businesses in the digital age. Established since 1989, Global Technology Integrator Limited (GTI) focuses to help public and private organizations select, architect and implement advanced IT solutions to empower their business. We provide leading edge solutions of modernized infrastructure, IT security, cloud computing, mobility, CRM, digital marketing and a broad portfolio of IT services that serve the needs of enterprises and public organizations in Hong Kong and in China. We are committed to deliver top quality services by conforming to important ISO/IEC quality standards backed by our established best practices and effective service management systems and processes. Headquartered in Hong Kong, the company has its offices in major cities in China including Beijing, Shanghai, Nanjing, Guangzhou & other cities. Solgari provides Compliant, All-Channel Cloud Communication Services to FinTech, Financial Services, eCommerce, Retail, Logistics, Recruitment & Government customers in 40 countries to date. Solgari’s cloud software service provides all the business communication channels – voice, video, chat, IM & SMS – while also including compliant recording & archiving of all communications.